We are our children's first, and perhaps most important, teacher. However, if we get it right most of what teachers do is not actually 'teaching' as such, but 'facilitating learning'. How much of what you know now did you learn by a parent or teacher lecturing you, and how much did you learn by them helping you to find out for yourself? You may be surprised when you really think about it how much of what you retain you discovered for yourself. You've probably heard of 'home education' or 'home schooling' (the American term) which conjures images of sitting down with textbooks at home, but perhaps 'unschooling' is a less familiar term. Yet this is the crucial learning style that most pre-school children and their parents or carers are actively involved in every day. For many this is an instinctive process - you teach your children to count by singing counting rhymes at bedtime, counting as you walk down steps or when sharing out treats. 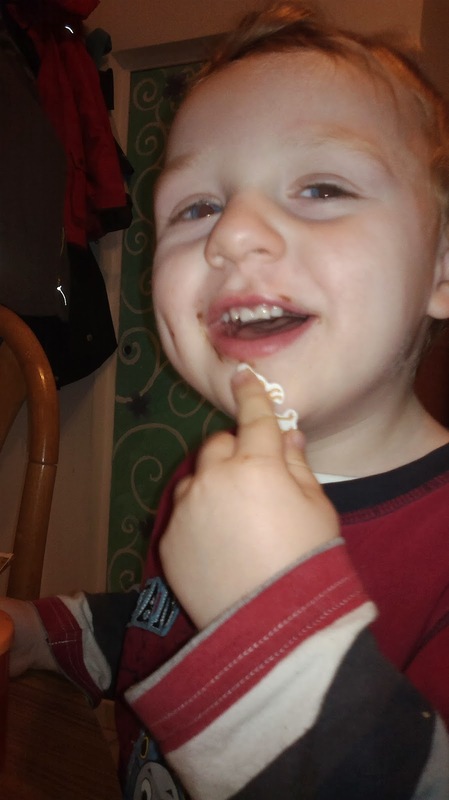 Very few people would sit a 2 year old down with numbers on flashcards, but by exposing children to numbers in every day situations most will pick up counting as naturally as they learn to talk. One of the benefits of the unschooled learning that we do with our little ones is that we can spontaneously engage with them in whatever their current interest is, and provide opportunities for them to immerse themselves in learning about all sorts of things through this topic. If they show a fascination for Egyptian mummies at age 5, why wait until they cover it in their learning journey at school at age 11, by which time their interest may have moved on to something else? The downside could be children who are bored at school having already thoroughly covered a topic, but a good teacher will be able to draw on their past learning and provide them with stretch to take their knowledge further, and for children who continue to be home educated this issue won't come up anyway. When, or if, we send them to school we can continue this partnership in their learning because as a parent you can support and extend their own interests and the topics they want and need to cover. My boys are pretty typical of small children and share a love of anything to do with dinosaurs. We have a big box of plastic dinosaurs donated to us by a lovely friend and these have had all sorts of adventures and educational uses. One of the most basic activities is dinosaur grouping. I've mentioned in a previous post how grouping items is a step towards shape recognition, which is in itself a step towards reading and maths. You can group your dinosaurs by species, by colour, by size or by stance for example. If you know the names you can introduce them 'can you find me another Triceratops - that's the one with three horns on its head'. If you're learning Makaton together, you can sign for the dinosaur you want as you say it 'I would like the blue dinosaur please'. You can introduce comparative sizes 'can you find me a dinosaur that is bigger than the one I have' and positional language 'can you put that dinosaur behind the one I have here'. Today though we hit the jackpot as far as the boys are concerned. Courtesy of the amazing folks at Macmillan Children's Books we were sent a parcel full of the most beautiful dinosaur books. They are based around an exciting new Walking with Dinosaurs 3D film coming out in December and the boys wasted no time in climbing onto the sofa and surrounding themselves with their haul of treasure. 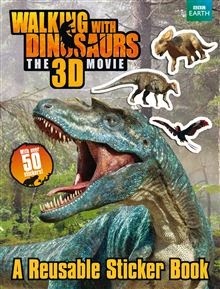 We have read several dinosaur books together, but these are the first where the dinosaurs look so real and not like cartoons, which really caught the boy's attention. 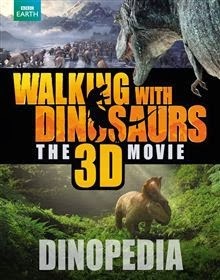 The first book out of the box was the Dinopedia. This is a lovely hardback encyclopedia covering the dinosaurs that are in the film, including Pachyrhinosaurus (pronounced 'patchy - rhino -sore -us'), the species of the film's main character. Each pair of pages is brought to life with a full page still from the film alongside simple and informative text. The Dinopedia also explains about the evolutionary transition between dinosaurs and birds, how dinosaurs nested, whether they were warm blooded or not and how they grew among other things. Up to date paleontological knowledge is presented in a way that you don't have to be an expert to understand, which makes it perfect to read out loud to smaller children or for confident readers to enjoy by themselves. Ollie loved the images of the Ankylosaurus - he often draws them but had never seen one that looked so lifelike. Toby loved the early birds and Pterosaurs and kept shouting 'duck' and signing 'bird'. My favourite element was the introduction to a real scientist on every page, with a photo and a brief bio about their work. The scientists featured are fairly young, of several different nationalities and there's even a lot of women, all of which is fantastic for breaking down the stereotypes that scientists, paleontologists and geologists are all old men. This makes it much easier for children to picture themselves in these roles in the future and have a reason to hang on to childhood interests as they grow. 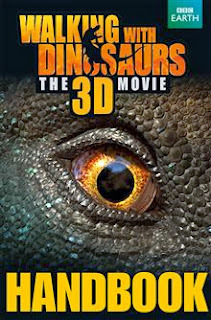 The next book we looked at was the Walking with Dinosaurs the 3D Movie Handbook. The Handbook sees the basic story of the film narrated by one of the characters, Alex the Alexornis bird. It is beautifully illustrated throughout with stills from the film on every page. There are also fantastic information boxes as you progress through the story each of which explain a key idea or introduce a species. The book is presented as chapters, which makes it ideal for Ollie as I can use a chapter at a time as one of his three bedtime books without having to attempt the whole book each time. The way the information boxes are scattered through the pages means that you can either read the chapter straight through and miss them out, or take breaks from the story to read them depending on how your little one's attention is holding. 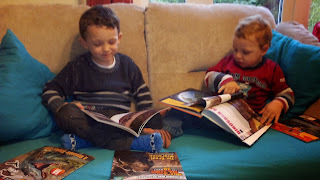 I think we will be returning to this and the Dinopedia over and over in the future because the knowledge to be gleaned will grow as Ollie's understanding increases. 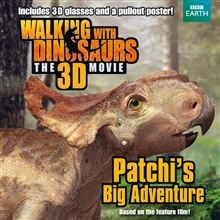 The third book Patchi's Big Adventure is a really novel concept for the boys - a story book that comes with a pair of 3D glasses which you can use to marvel at the large 3D pull-out poster in the center of the book. The rest of the book is a straightforward story book following one of the adventures of the main character of the film, Patchi the Pachyrhinosaurus. As with the other books it is rich with gorgeous stills from the film. I like that it is not 3D all the way through as it would have been difficult to maintain the pace of the story for an older child reading alone if they had to keep putting on and taking off the 3D glasses. Ollie was particularly taken with the picture of the baby dinosaur next to a Fly Agaric toadstool. He has the very common misconception that dinosaurs were all massive like the impressive skeletons he's seen at the Natural History Museum, so he took a lot of convincing that it wasn't a 'normal sized' dinosaur and a giant mushroom. 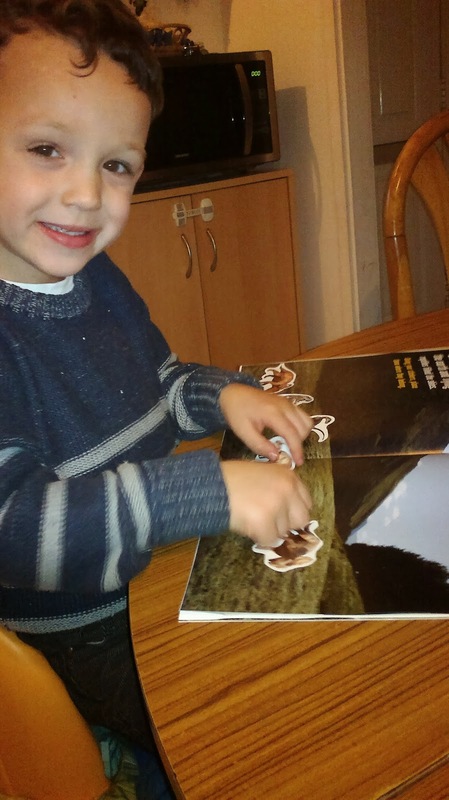 As you can see from my pictures above, both boys had a great time with the Sticker Book that we were sent. The backdrops were made from lovely scenery from the film and there were plenty of great quality reusable stickers to add to the backdrops. We used the stickers to work out which characters would walk on the ground and which would fly in the sky, and in Toby's case which were the funniest ones to stick to his face. The stickers were well made and peeled off cleanly, which you will know to be really important if you've ever had a toddler upset because a leg or tail tore off a sticker they were trying to peel from it's backing. They are strong enough that you really can keep peeling them off and sticking them on different scenes. There is also some basic large text on each page which is useful to set the scenes and to encourage new readers to pick out some words for themselves. The final book was our choice for a bedtime book tonight. The Great Migration is a lovely story from the film following the main character from hatching to the successful completion of his first seasonal migration, with plenty of adventure along the way. 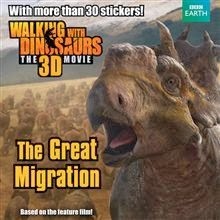 As well as being a very positive story in it's own right, The Great Migration is also a good introduction to the concept that many animals move around to find food or to escape harsh weather conditions, which is handy at this time of year as we see the geese flocking into Britain for the winter in their V formations. You can springboard into talking about food chains too since there are encounters with predators and herbivores. This book also comes with a detachable page of stickers, which is always a winning addition to books for children. Overall then I would highly recommend this set of books for any child, but especially if you are doing what comes naturally and facilitating a child delving more deeply into their current obsession.